Replacing the current 2-stroke, 125 cc used in the GP125 class, Honda developed the new “NSF250R” as a machine for entry riders to participate in the battle, seizing the opportunity provided by the opening of the 4-stroke, 250 cc Moto3 category, which begins in 2012. With a mission of broadening the base for motorcycle motorsports cultivated by the RS125R, we aimed for a high-performance, lightweight, and compact racing machine that allows RS125R users to ride with the same sense of comfort and inherits important elements from the RS125R such as the ability to learn the basics for moving up from entry level to the MotoGP. 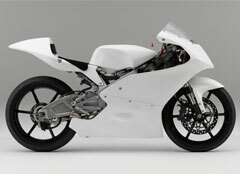 As a leader of the“ NSF250R” development, on top of seeing the NSF250R expand the base for 2-wheel motorsports, as the RS125R did, and sharing dreams and excitement with our customers by revitalizing the Moto3 class, our greatest joy would be for the machine to serve as a springboard in creating future MotoGP champion riders. We really look forward to this new“ NSF250R” being loved by more people around the world and helping them to realize their dreams in the world of motorsports, all the while being charmed by the machine.